Tonight’s episode of Scandal was, as always, deliciously scandalous! Gladiators got to find out how they were going to cover for James’ murder and Olivia found out that Jake was the one who killed James. I cannot wait for next week’s episode and towet your appetite we have some juicy spoilers and a sneak peek video of “Mama Said Knock You Out” which will air March 27th, 2014, for your enjoyment below! On tonight’s episode we picked up where we left off last week with Jake killing James. Most of the show covered the aftermath of the killing. Olivia found out that Jake killed James and she was not pleased. She went to her father for comfort but he basically told her it is the job. David Rosen had trouble doing what Jake wanted him to do. Sally sets a meeting with the NRA which sends the WhiteHouse into a tailspin. Cyrus came up with a brilliant idea and Fitz came out for gun control following the killing of James and his own shooting. The move was so good he immediately raised in the polls. More happened! If you missed tonight’s episode you can read a full and detailed recap, right here. On the next episode the grant children visit the White House. There have been many stories circulating that with the Grant children coming to town it will be revealed that one of the children is not Fitz’s but his fathers. Fitz’s father raped Mellie so one of his children may actually be his brother and not his son. “Mama Said Knock You Out” was written by Zahir McGhee and directed by Tony Goldwyn. Scandal Season 3, Episode 15 “No Sun on the Horizon” airs on ABC on March 27th, 2014. Check out the preview video below and let us know in the comments below what you think! 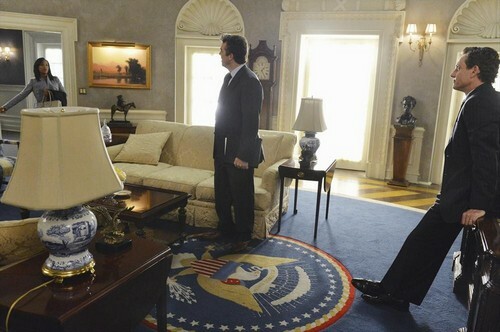 Scandal Spoilers: Who Is The Real Father Of First Lady Mellie Grant’s Children, President Fitz Or His Father?